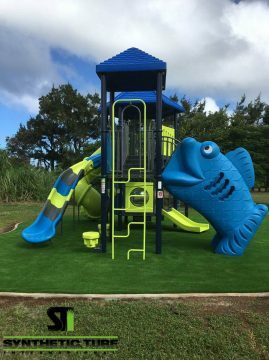 Recently Synthetic Turf International dealer Rory Otto and team of NyLawn installed STI products at Kauai Christian Academy. Kauai Christian Academy is located at 4000 Kilauea Rd., Kilauea, HI on the island of Kauai. It is a private school located on a beautiful 10 acre campus on the way to the scenic Kilauea Lighthouse. The school serves pre-school through 12th grade. Rory and his team used SoftLawn® Soft Play with a foam pad for fall height safety over an aggregate base with a concrete curb. The NyLawn team also installed the playground equipment as well. The project was just completed and took just under two weeks from start to finish. Its approximately 1500 square feet in size and meets all safety standards required. Some of the biggest benefits of synthetic turf playgrounds is the usability of it. Even if it has rained for days, the turf will drain and still be usable. 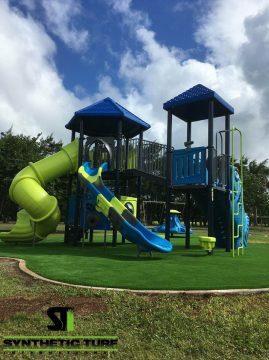 Founded in 2003 and headquartered in Honolulu, Hawaii, Nylawn is a Licensed Landscape Contractor and Hawaii’s leader in the synthetic turf industry. Rory D. Otto, founder, had a vision to have his very own Backyard Golf Resort. Through vigorous research and testing it became quite apparent that Synthetic Turf International, STI, was the choice supplier of synthetic putting greens, lawn, fringe grasses, playground safety surfacing and sports fields. STI maintains a long lasting endorsement relationship with David Leadbetter, the well-known and most sought after golf instructor. NyLawn soon became the exclusive partner of STI for the Hawaiian Islands.